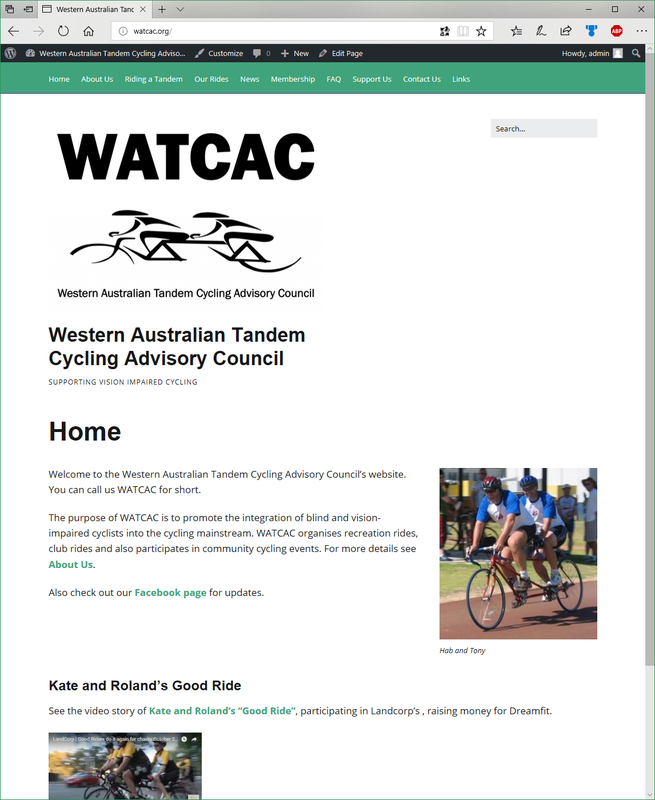 Sometime during the night hours 27th to 28th March 2019 the WATCAC (Western Australian Tandem Cycling Advisory Council) trailer was stolen for a member’s driveway in Bassendean, WA. The trailer contained 2 x red straight bar tandems, 3 x Vetta road tandems (2 x black and 1 x blue) and 1 x Contarino black road tandem. The four road tandems were recently involved in the Life Cycle for CanTeen Charity Ride from Perth to Busselton 300kms over 3 days. The loss of these tandems causes considerable hardship to our ability to cater for the Blind and Vision Impaired. The trailer has since been recovered, however the six tandem bikes remain missing. The four road tandems were some of the best bikes in our fleet. Below are photos of the missing tandems along with the ABC News report and Facebook article from the 29th March 2019. 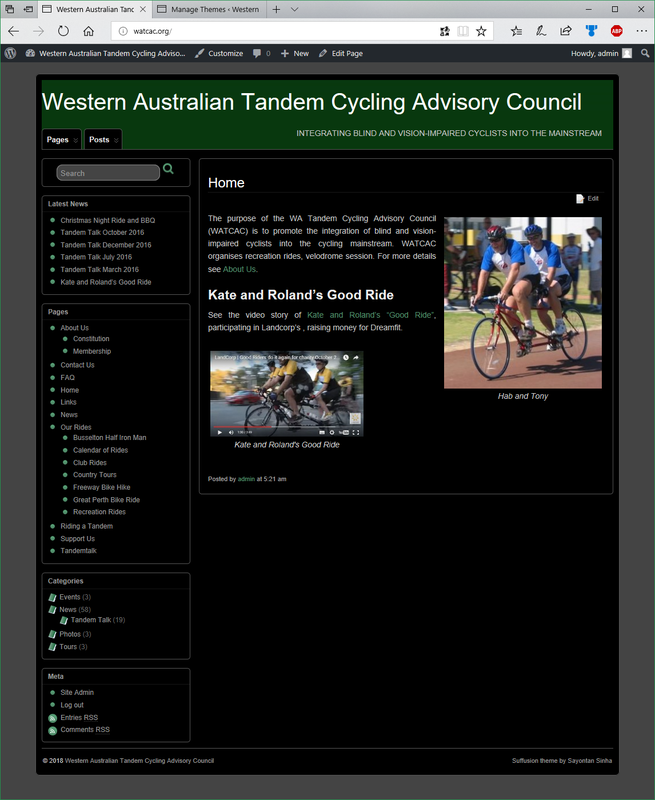 ABC Perth News – 29 March 2019 on the theft of the WATCAC (Western Australian Tandem Cycling Advisory Council) trailer and six tandem bikes. 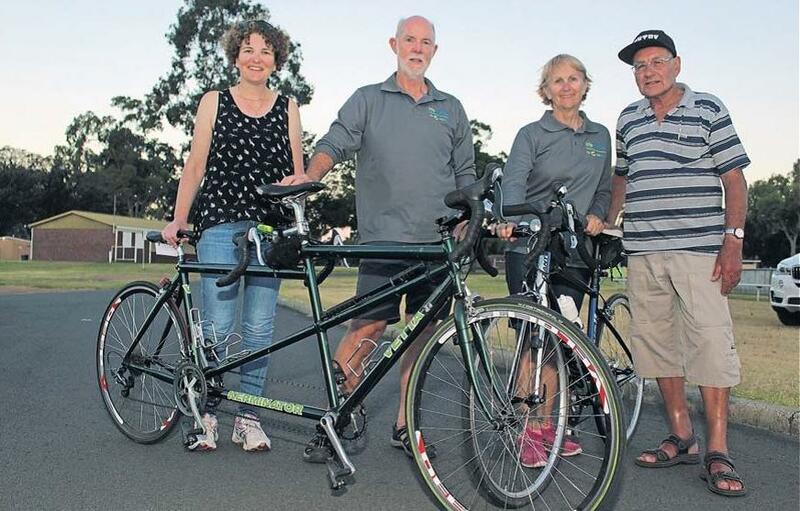 A Perth charity which helps blind and vision-impaired cyclists say they are devastated after six of their tandem bicycles were stolen. 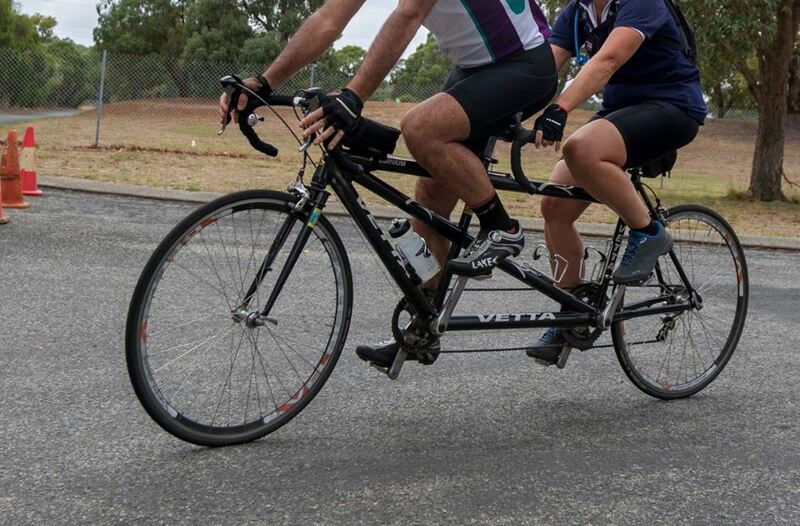 Erin McGlew, president of the Western Australian Tandem Cycling Advisory Council, which promotes the integration of blind and vision-impaired cyclists into the cycling mainstream, said the group has had to cancel their next events following the theft. “One of our members who had very kindly had our trailer parked at her place, woke up on Thursday morning to find the trailer and six of our tandems had been stolen, and the lock had been cut during the night,” she said. 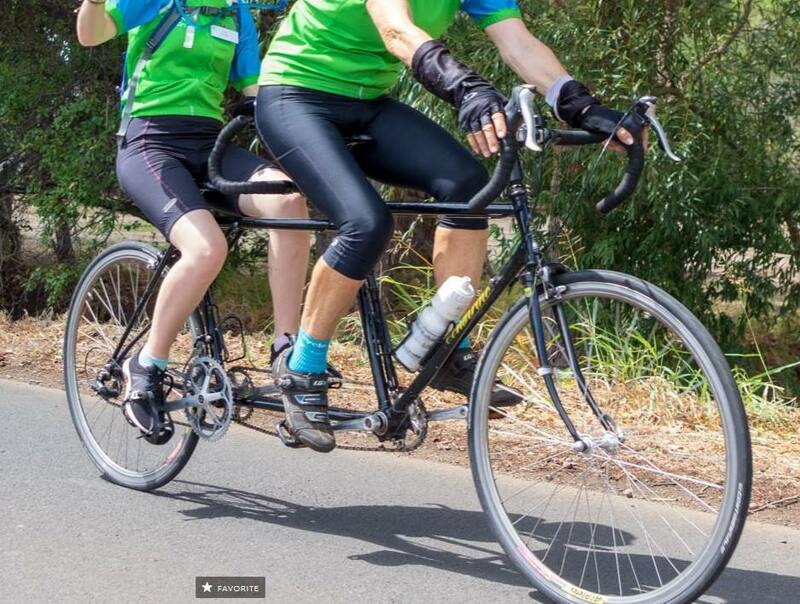 Ms McGlew, who herself is vision impaired and rides tandem, said the tandems were recently involved in the Canteen Lifecycle Charity Ride from Perth to Busselton and their loss was a “huge blow to our ability to cater for blind and vision impaired cyclists” and said she hopes the bikes will be recovered. “From a social perspective and from a fitness perspective, it’s really important for blind and vision impaired people to have these sorts of opportunities. “The loss of these tandems causes considerable hardship of our ability to cater for the blind and vision impaired,” she said. Howdy all and welcome to the August Tandem Talk. Here’s a wrap up of what’s been happening over the last few months. Thank you to Roland for doing such a great job co-ordinating the rides in my absence. There have been three Rec Rides since the May newsletter. 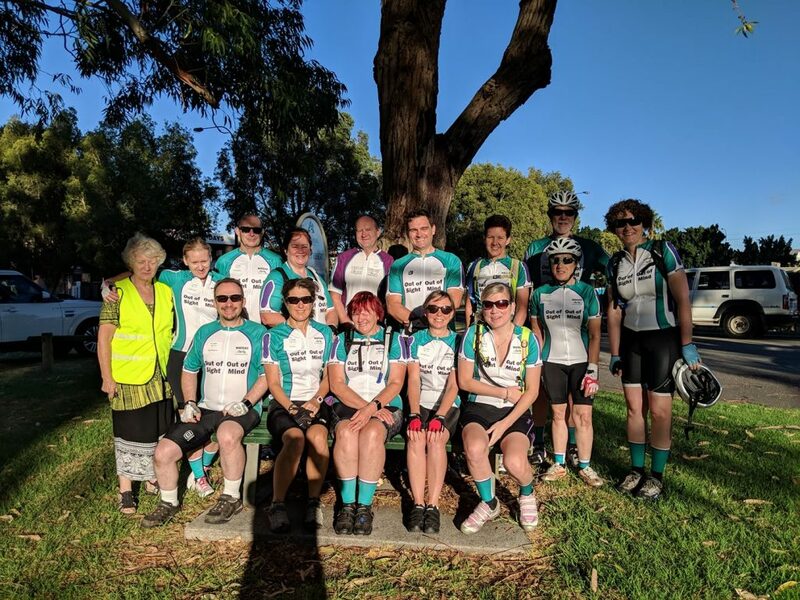 On our May Mothers’ Day Ride 7 tandems and 3 bikes cycled from VisAbility to Kent St Weir via the Swan and Canning River, returning via Curtin University. June’s ride was cancelled due to thunderstorms but the second weekend in July turned out to be one of the few sunny days this winter. Once again 7 tandems and 3 singles headed out from VisAbility to explore a new route through Manning, and to discover a new coffee stop. This was a truly enjoyable ride, and one we will do again soon. Last Sunday a record 8 tandems and 3 bikes rode the Perth foreshore, crossing the new Matagarup Bridge twice. This turned into a rather hectic ride, as the PSP on the city side of the river was closed for the Targa Car Rally and the paths around South Perth and Burswood were crowded with people. Next time we cross Matagarup bridge it will be outside of footy season, and we will head away from the city. Our next Rec Ride is scheduled for Sunday 9th September, with our destination being a coffee shop with braille menus. Check your email or Facebook for details. There have been four Club Rides since the last Tandem Talk, with both July rides cancelled due to bad weather. While the route for these rides has remained the same (and will most likely be the same again this Sunday) there has been some drama with bike mechanicals, community dog walks and, unfortunately, cars broken into. But it will take more than that to stop us. The next Club Ride will be on Sunday, 19th August., 8:00 for a 8:30am start from Rayment Reserve, Lathlain. Registration is now open for the 2019 LifeCycle for CanTeen On-Road ride. Next year will be the 20th time this event has been run, with cyclists riding from Bassendean to Busselton over 3 days to raise money for CanTeen. If you are interested in joining others from WATCAC in this event, please talk to a committee member so that we can organise bikes and pilots. Training will start soon. The clinic. held on Sunday 29th July at George Burnett Park, was well attended with several new volunteers coming along, complete with their own tandems, and some VI members returning for refresher training. Thank you to all who came along to help, especially to Connie, Sue, Jo and Paul, who ended up helping a lady who broke her ankle in the skate park, calling an ambulance and comforting her until it arrived. We look forward to having our newly skilled pilots and stokers along on a ride or two soon. Can you sell chocolates to your work colleagues? If so, please contact a committee member, or talk to Adriana if you want to know how it’s done. Stay tuned for information about a pancake day coming up later this year. What’s your favourite topping? Howdy All and welcome to the May Tandem Talk. Here’s a wrap up of what’s been happening over the last few months. There have been two Rec Rides since the last newsletter. In March we had a great turn out of 7 tandems and 4 supporting bikes and welcomed some new riders to the group. We took the South Perth Foreshore PSP to the Narrows and then crossed the river to Crawley before heading back along the Perth foreshore to VisAbility. At the turn-around point there was some discussion about how best to get through Elizabeth Quay. A plan was formulated but not everyone was listening. I watched in amazement as four bikes in our group went in four different directions. Turns out that the best way to get a big group safely through Elizabeth Quay is to scatter and meet up on the other side. In April we took three goes at holding a Rec Ride. Attempt one saw a shortage of pilots and bikes, attempt two was cancelled due to thunder and lightning, but on the last Sunday of the month we made it. Four tandems and 7 support bikes (that’s a lot of support) rode from VisAbility to The Raffles. We had planned to stop for coffee in Applecross, but a strong tailwind on the way out got us there early and we were anxious about heading back into the same wind, so we turned straight back and stopped for coffee in Lathlain. Our next Rec Ride is scheduled for Sunday 13th May, leaving from VisAbility at 8:30am. There have been three Club Rides since the last Tandem Talk. In early March we continued our training for the LifeCycle On-Road ride, riding loops behind the airport and working on group riding and cornering skills. Read more about the LifeCycle ride later. After the big effort of the LifeCycle weekend we took a break and got back on the bikes on April 8th. This ride coincided with the 3 and 5 Dams Challenge ride, an epic ride of 200 plus km over plenty of hills and past the dams of outer Perth. We rode the 5 Domes; a less challenging route that took us past 5 Dome Coffee Lounges. Thankfully Steve was able to guide us past some roadworks that blocked our planned route to Dome number 3 in Caning Vale. Yesterday, Dee and I on a tandem and four gents on single bikes, braved the wind and rain to ride the Jandakot loop. We fought a brisk westerly breeze around three quarters of the course, but it did assist with the last bit of the ride home. And the river spray washing over us along the Como foreshore was refreshing. The oversized, home-made sausage rolls at The Stadium Coffee Shop (note: this is not at The Stadium) were rated second best in Perth by Paul, and really hit the spot post-ride. Several WATCAC members, including myself, will be away for June, as we are off to cycle The Camino de Santiago in Spain. Roland will be organising the rides in my absence. Please be kind to him, as he will also be short a pilot or two. I’ll see you in July. On Saturday 10th March some of WATCAC joined Canteen Lifecycle on a very fun and rewarding South West fundraising ride. On single bikes we had David, Paul, Haylee and Ian, and on tandems there was Connie & Sue, Dee & Jennifer, Adriana & Hab, Kate & Roland and Meredith & Roz. Our crew joined approximately 125 other Lifecycle riders. The trip started bright and early in Bassendean and we made our way to Busselton via campouts at Pinjarra SHS and Brunswick Junction footy club. This is the first time that WATCAC has joined this event and I am sure it won’t be the last. The event was so well organised regarding traffic logistics, food, accommodation and safety. We were all moved by the stories from young people who spoke throughout the event and inspired us to keep peddling for this important cause of supporting young people affected by cancer. WATCAC was the 4th top fundraising team for this event raising over $8,800. Thank you so much to all our supporters. We also made the Harvey-Waroona Reporter, with WATCAC represented by Dee and Hab – the page 5 news article appears at the end of this newsletter. A clinic for new and existing pilots and stokers is planned for Sunday July 22nd. If you have someone you want to cycle with, this is a great opportunity to introduce them to tandem cycling. If you have been thinking about helping pilot but aren’t sure where to start, please save this date (with Sunday 29th July as reserve). 2018 Membership fees were due on 31st March. Note that if you haven’t paid your membership you will not be covered by our insurance policy. You are still welcome to ride with us, but we would love to have you fully on board. Your membership fees go some way to paying for the continued maintenance of our fleet of bikes. When paying fees into the WATCAC account by bank transfer please write “Membership Subs” and your name in the narration. Banking details appear at the end of this newsletter. Bike loan fees run from 1st Feb to 30th June and 1st July to 30th Nov, at $50 per period. If you have a WATCAC Tandem on loan, please contact us about renewing your loan or returning the bike. Your WATCAC Committee have now finalised the new membership and nomination process as per the Australian Council for Not-for-Profit Charities Constitutional Model Rules. We advised members at the AGM that WATCAC have adopted the Model Rules as our updated constitution. With this comes the need for updated process such as the nomination for NEW membership process. Returning Members: Please complete the membership only section of the new forms, when paying your fees, as this will update your details and WATCAC then complies with the new Constitution. Please pay your fees by 31st of March 2018 to remain as a financial member – after this date you will be required to complete the full new member nomination process. New Members: Please complete the full membership nomination form as per instructions in the attached document. If you have any questions or difficulties with the form, please don’t hesitate to contact Trevor or Haylee. Have you ‘Liked” us on Facebook yet? Our page can be found here. We will use the page to promote WATCAC to the wider community, post notifications of upcoming rides (in addition to your regular emails) and report on rides and other events. We will endeavour to do this while maintaining the privacy of our members. Talk with a committee member should you have any concerns. Congratulations to WATCAC members, Connie and Sue on their marriage. May the wind always be at your back and the pot-holes few and far between. The WATCAC Team pose for a photo before taking off on the LifeCycle On-Road for CanTeen. HELPING raise money for youth cancer support organisation CanTeen, almost 200 cyclists arrived in Brunswick on March 11 including, for the first time, blind riders as part of the group. Now in its 19th year, the ride is part of the Lifecycle for CanTeen charity which makes its way from Bassendean to Busselton over three days. At the completion of day two’s ride, the group held its fifth annual bowls competition at the Brunswick Bowling Club before dinner at the Tom Pearson Pavilion. Long-time supporter of the event and Brunswick Lions Club member Laurie Parravacini presented the riders with $1000 on behalf of the club. “Seeing the number of people around here today with bikes riding in the heat of the day like they have been, they do a wonderful job,” Mr Parravacini said. Ride founder Jenny Aramini said talks from recipients of CanTeen’s programs at a stopover in Harvey had fuelled the riders on the way down. More than $140,000 was raised from this year’s ride, smashing last year’s total of $118,000. For the first time in the ride’s history, the group included four blind riders on tandem bicycles with ‘pilots’ in front. WA Tandem Cycling Advisory Council president Anthony Collier said he had supported blind cycling for 40 years and this was the first mainstream ride, not a community event, to include them. “They have asked for no change of rules in terms of what group they’re in, they’ve all trained up to ride a peloton, to ride the 100km a day over three days,” he said. Welcome to the First Edition of Tandem Talk for 2018. I hope you all had a wonderful Christmas and that the lovely, mild summer we are having has presented you with multiple opportunities to get out on the bike. There has been one Rec Ride so far this year. In February, 6 tandems and 5 bikes rode from VisAbility to Garvey Park and back. The ride was 31km, with some lumps and bumps and twists and turns around the Ascot foreshore, as well as a bit of a sprint on the way home. It was great to have some new people along for this ride, as well as some familiar faces back after a long break. Our next Rec Ride is scheduled for Sunday 18th March. Note that this is the third Sunday, and not our usual second Sunday ride date. We will cycle from Bayswater Train Station to Nedlands and back. There were two Club Rides in February. On the first Sunday of February, 5 tandems and 6 bikes left VisAbility to meet up with riders in the Life Cycle for CanTeen On-Road ride, on the Shelley Foreshore. We spent some time there learning how to ride as a group and how to roll-through the peloton, with everyone taking a turn at the front in an organised manner. The WATCAC Club Riders have varying levels of experience and expertise in riding as a group, but I think everyone learnt something useful. As a number of WATCAC members will be participating in the Life Cycle ride, is was also important to let the other cyclists get used to riding with tandems in the mix. The remainder of the ride was taken up practicing our new skills on the way to Point Walter and back to VisAbility via South Perth. Last weekend 5 tandems and 6 bikes headed out again. This time from Bayswater, with the aim of practicing our group riding, and riding over 100km. The weather was mild and taking turns at the front makes the ride a lot easier for everyone. As we headed south along the Kwinana Freeway PSP I couldn’t help but admire how slick we looked, all in our new jerseys and working together as a team. In the end we rode 112km. Everyone’s recording devices were slightly different, so it was fun listening to random shouts of “I’ve done 100!” as we went along the South Perth foreshore. Congratulations to everyone who achieved their first Century! As part of the preparation for the 2018 LifeCycle Off-Road, there will be regular, planned rides out on the trails around Perth on the second Saturday and last Sunday of the month. If you are interested in having a go on the Mountain Bikes please have a chat to Roland or one of the committee members. It seems ages ago now, but for those of you who couldn’t make it here’s a short run down on the Christmas Night Ride. On a balmy Friday evening 16 WATCAC members and friends put on their best Christmas finery, attached musical, flashing, reindeer antlers to their helmets and lots and lots of lights to their bikes. Seven tandems and two single bikes then made their way from Hillary’s to Connolly to see the Christmas lights in Prairie Dunes Place. 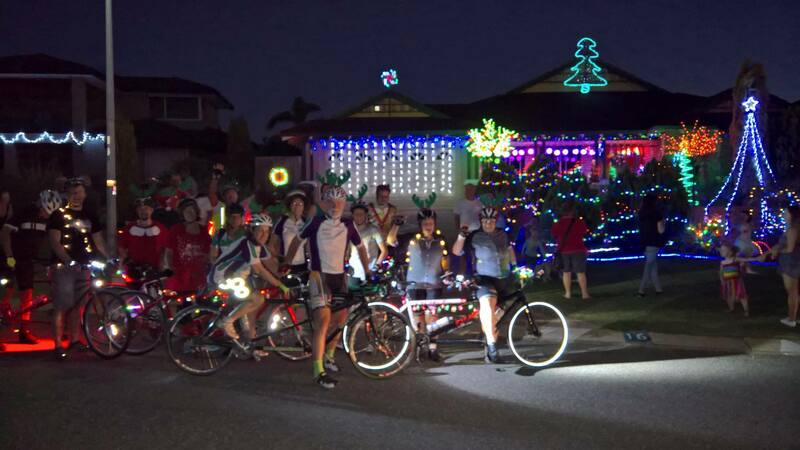 Every house in this street decorates their front yards with enough lights that I’m sure it could be seen from the International Space Station to raise money for Guide Dogs WA. As we walked up and down the street it was interesting to note the different descriptions provided by the tandem pilots. Erin wanted details about whether the lighting was warm or cool; Anthony gave a great commentary on the size, shape and colour of the decorations; however, by about half way through my description sounded more like this…“there are some lights, and some more lights, and lots of lights…: Sorry Dee. The smell of a BBQ full of sausages lured us back to Roland’s house, where we agreed that the Christmas decorations, and Roland’s Christmas shirt, were the best in Perth. Thank you for hosting us Roland. WATCAC has been contacted by a couple of vision impaired females, hoping to get into cycling. If you are available to pilot for a rec ride or two please let me know. We will run a mini-clinic before heading out, so don’t worry if you are feeling a bit rusty. As our Club Riding group has grown and diversified it has become apparent that we need to cater to a variety of skills and fitness levels. To do this, we are going to trial alternating skill focussed club rides with fitness focussed rides. (much like we accidentally did in February). The skills rides will focus on developing riding skills, such as rolling-through, riding to a cadence, hills, cornering etc. 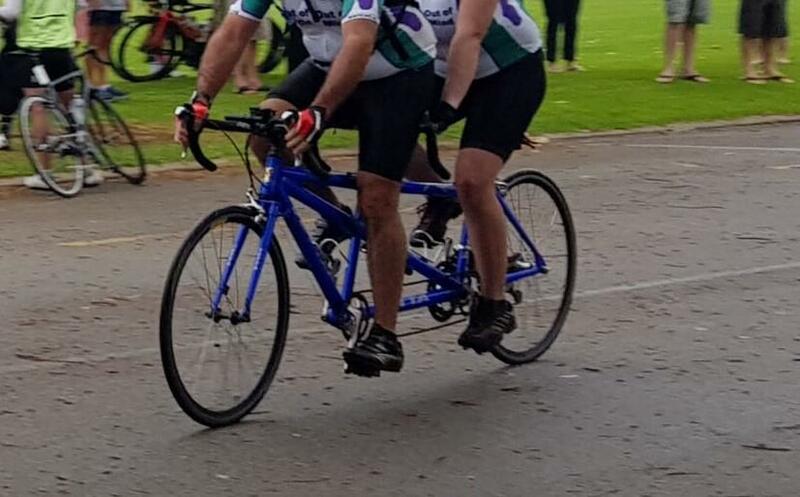 Anthony has kindly offered to lead us through this, and we will also look to inviting other experienced tandem cyclists and coaches to help. The fitness rides will focus on speed and distance, which should get easier as we become more skilled riders. They’re here and they look great. Almost everyone who ordered a jersey has theirs by now, but there are a few extras still available. Great value at just $60, let me know if you want one. $20 gets you a pair of matching socks to complete the kit. Your WATCAC Committee have now finalised the new membership form and nomination process as per the Australian Council for Not-for-Profit Charities Constitutional Model Rules. We advised members at the AGM that WATCAC have adopted the Model Rules as our updated constitution. With this comes the need for updated process such as the nomination for NEW membership process. Updated membership forms were emailed on 20th Feb and are available from the Membership page. As approved at the AGM, membership fees have increased to $40 per year from 2018. Your membership now includes a Tagissar ICE (In Case of Emergency) Sticker, while stocks last. 2018 Membership fees are due by 31st March. WATCAC will be recalling all Hired Tandems for mechanical assessment and servicing. Hab will be in touch with current hirers. After a long time in a dark, dusty, neglected corner of the world wide web, we are bringing the WATCAC website into the 21st century. (Love your work Beau, but it’s time to renovate) Some changes have been made already, but there is more to be done. When you have a moment, please check out http://watcac.org/ and send feedback on accessibility, what needs to stay, what needs to go and what needs to be added. The WATCAC website has been upgraded to include the new branding with updated logos and colours and a cleaner look & feel. We hope you enjoy using it.